We saw in the previous chapter how resentment at the way in which the tribute issue had been handled contributed to the constitutional crisis and the subsequent spasm of revolt. The pall of Cypriot resentment lingered over the politically stagnant years that followed. By the end of the decade, with the resurgence of political activity in a growing economy and most dramatically, the outbreak of war, the issue became irrelevant. We will examine the efforts of the governors, in years of severe depression, to exploit the financial deficit—“the unfinished business”—of the 1920s, to bring about the return of the tribute surplus to the island and thus allow them to embellish their autocracy with a potential for economic growth. We will look at the extent to which the metropolitan response depended on the prospects of the island becoming a naval base. This tendency was symbolised in the equating of the return of the surplus with the extension of Famagusta port. 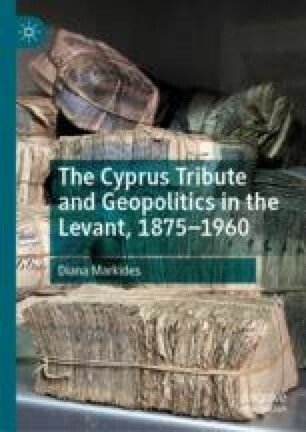 How far removed were these concerns from the very different world inhabited by the Cypriots? The receding prospect of enosis intensified their need to preserve their cultural heritage. Politics found subliminal expression in culture and sports, while an embryonic socialism found refuge in the trade union movement. At the same time, the urban Turkish Cypriots absorbed the attitudes of the Kemalist republic. How did the developments of the Second World War bring enosis once more to the political forefront? How did this link up with, and what other factors were involved in a new British willingness to invest in the development and welfare of the island?